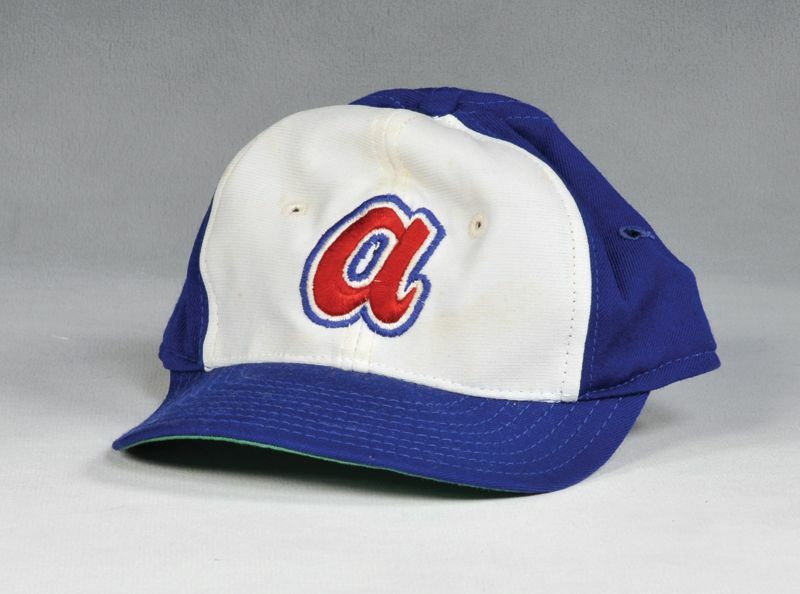 The Milwaukee Braves set up shop in Atlanta for the 1966 season. 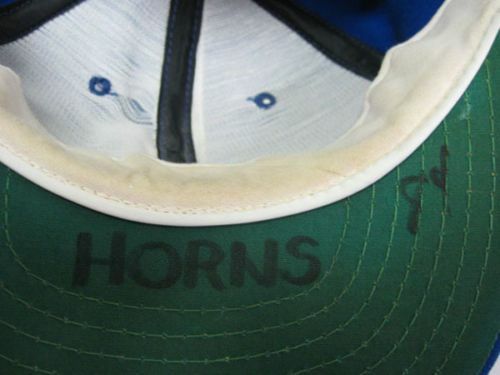 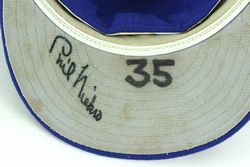 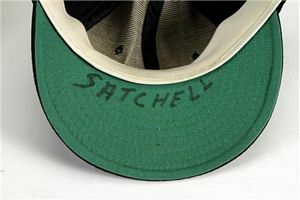 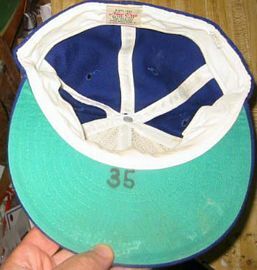 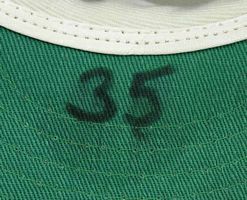 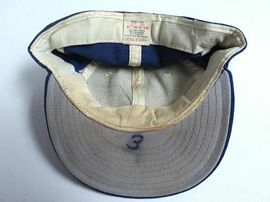 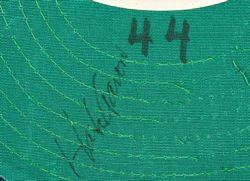 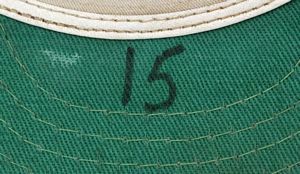 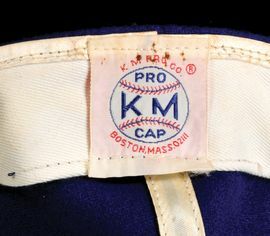 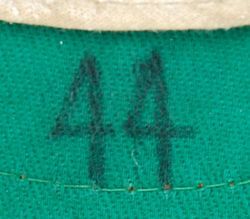 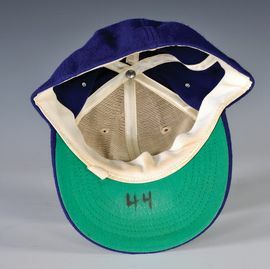 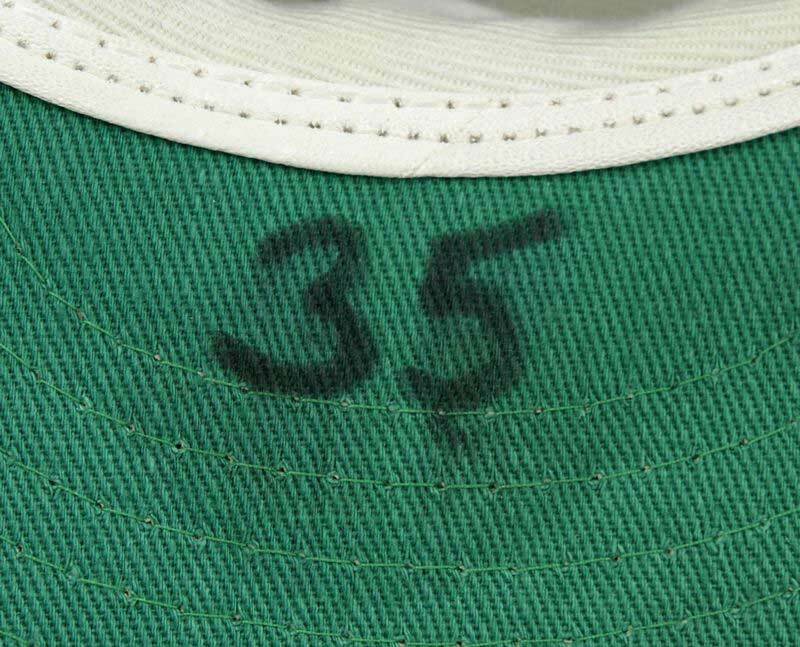 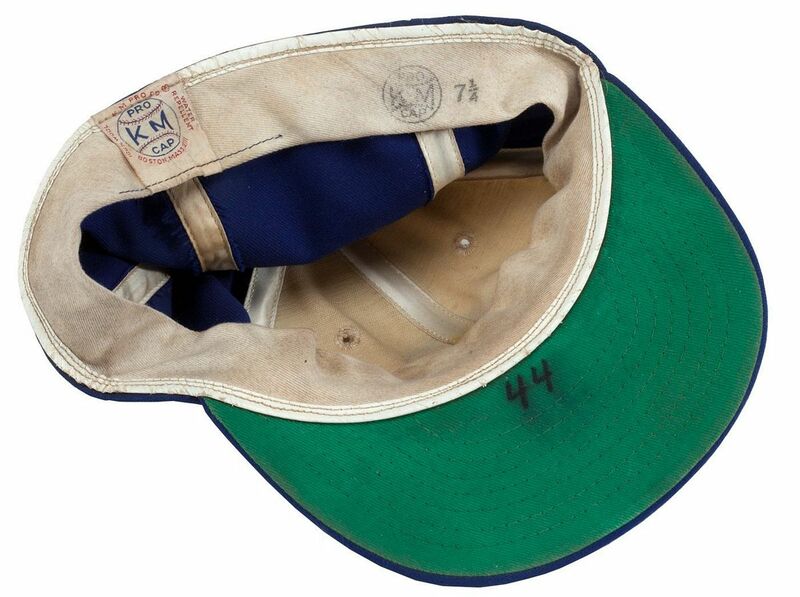 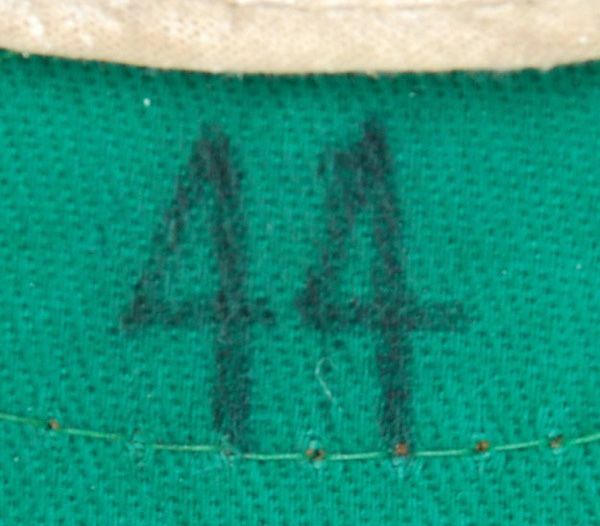 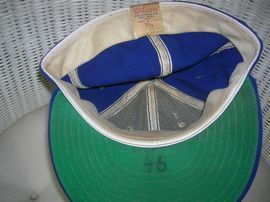 The team carried over the 1965 Milwaukee jerseys and caps but put a scripted A on the cap in place of a block M.
Home and road caps had red visors. An all-navy road cap is introduced. 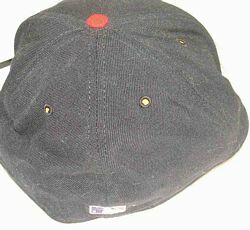 The red-billed cap is dropped as the all-navy cap is now worn home and road. 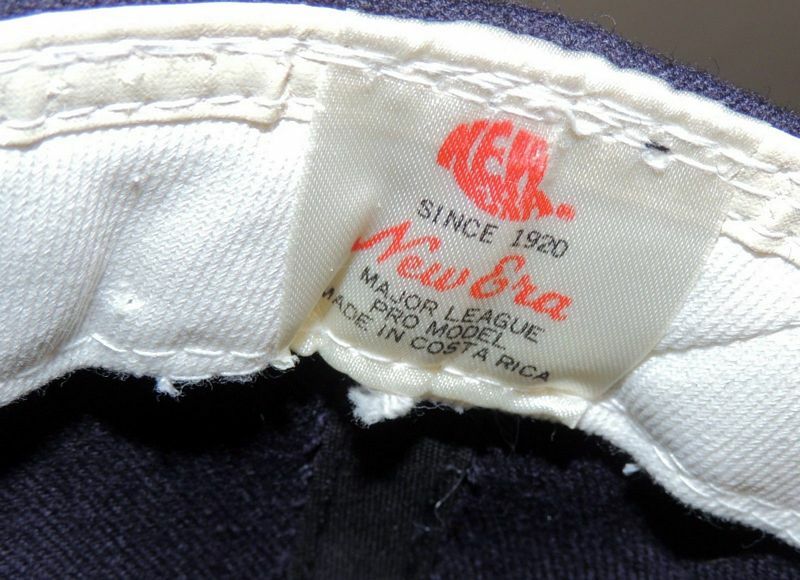 New Era caps show up around 1970. 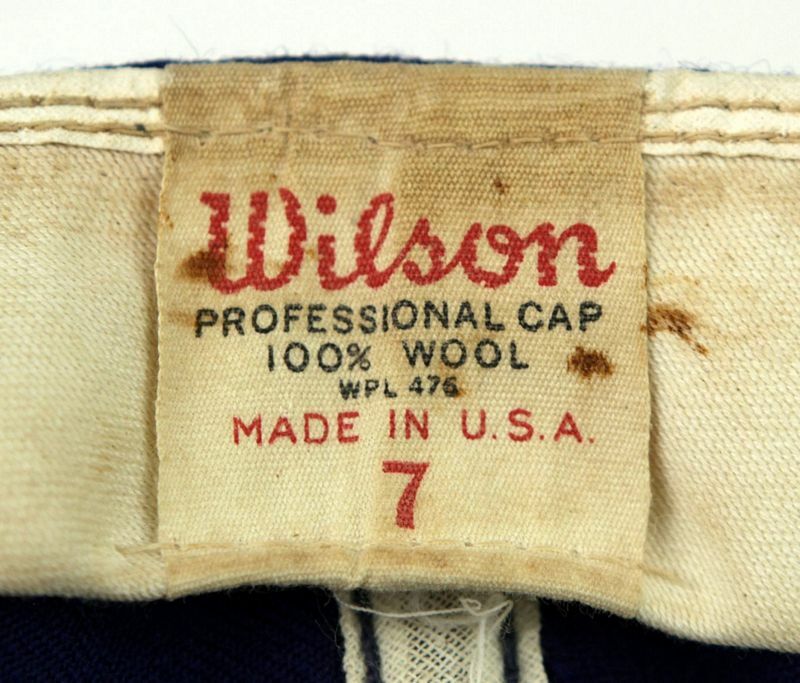 Not sure if they continued to use Wilson, but probably. The Braves introduce their (in)famous "softball" jerseys in 1972, made immortal by Hank Aaron's 715th home run in 1974. 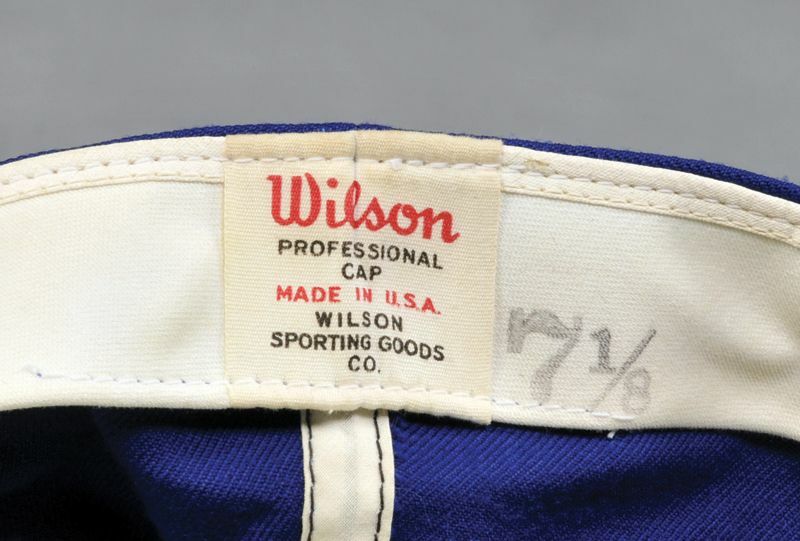 1972 caps are dark royal blue, almost purple. KM Pro's have soft thick wool. 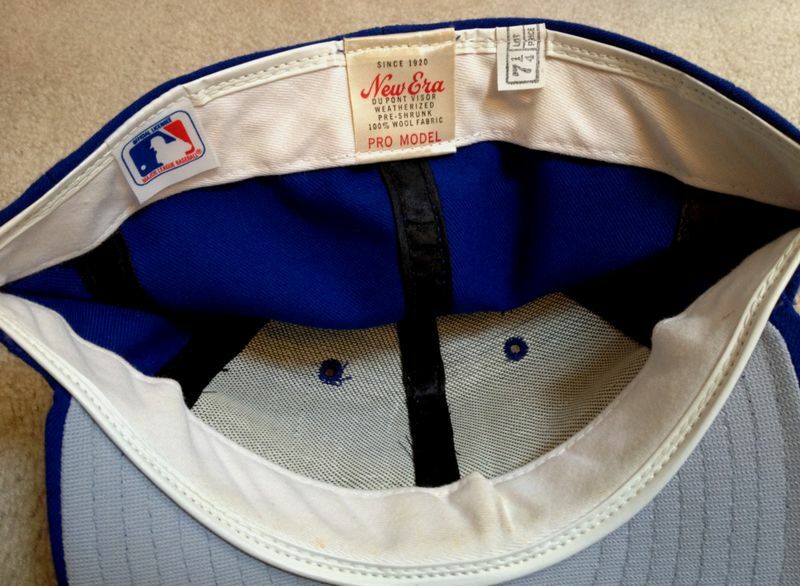 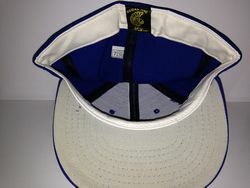 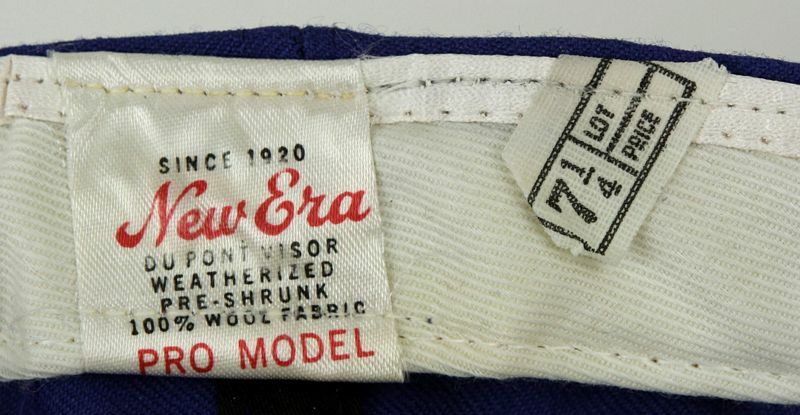 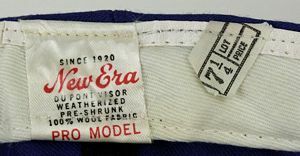 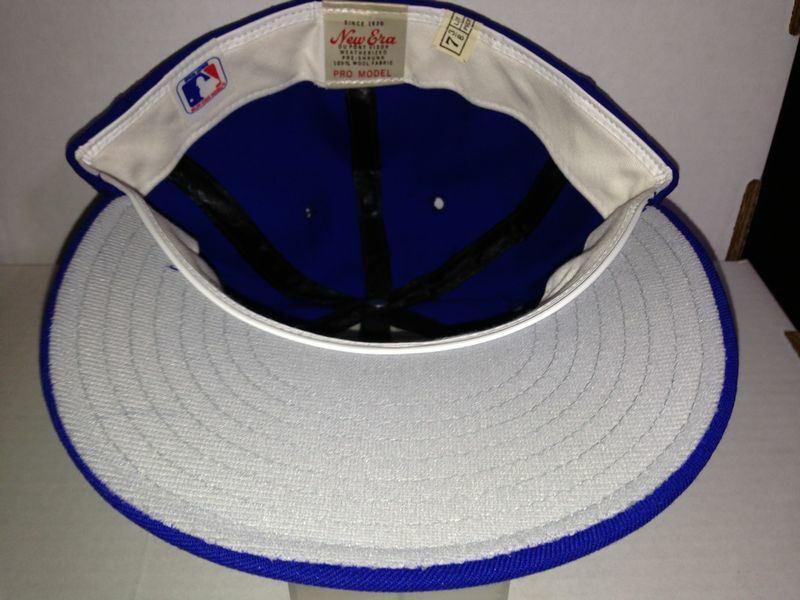 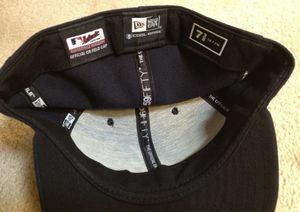 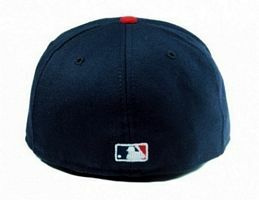 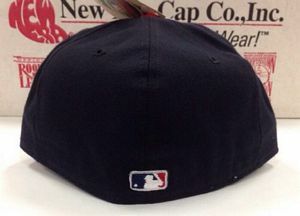 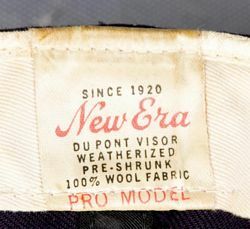 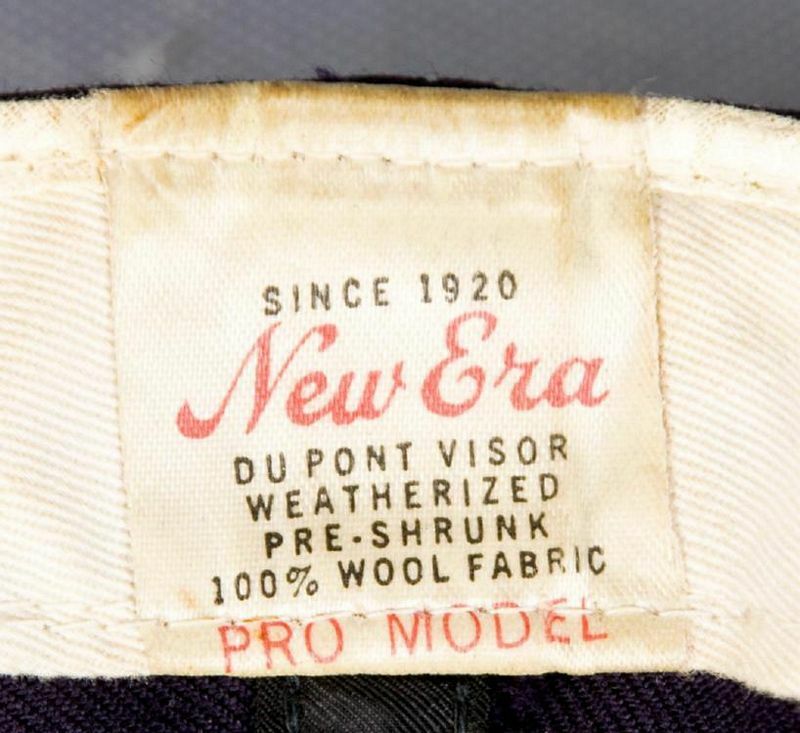 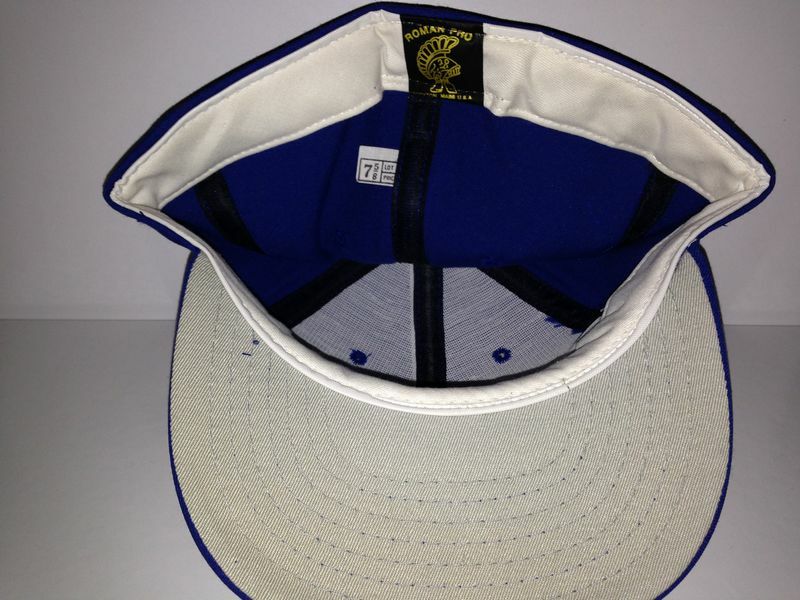 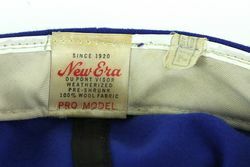 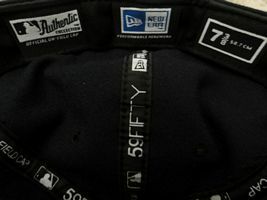 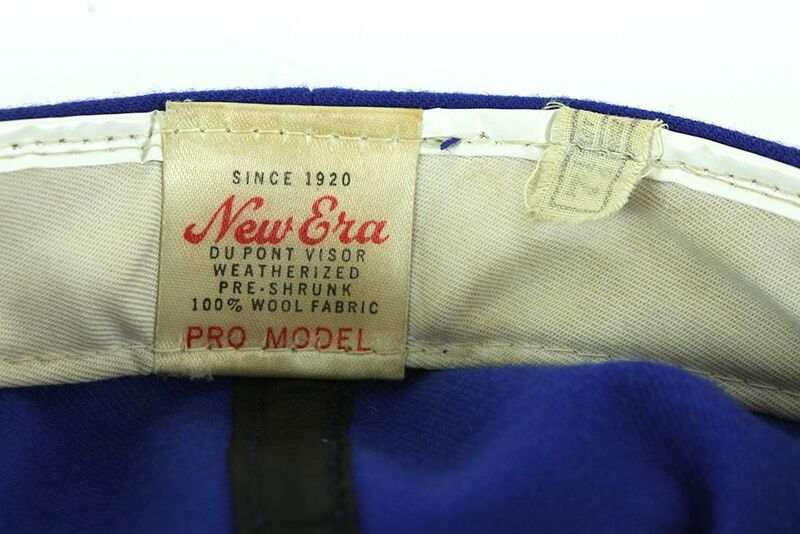 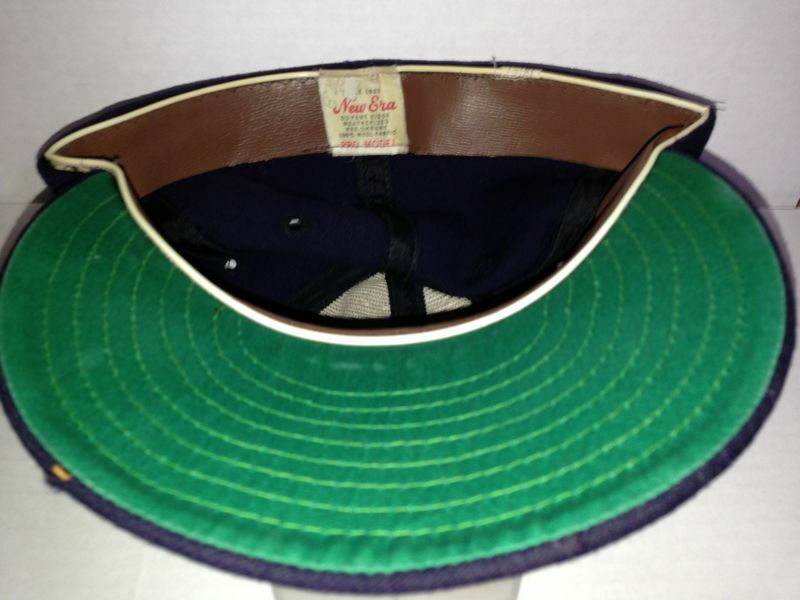 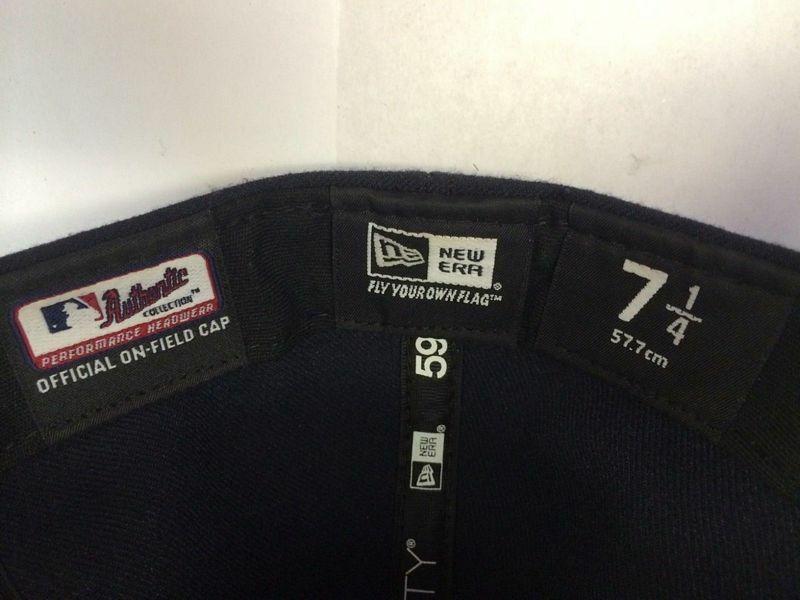 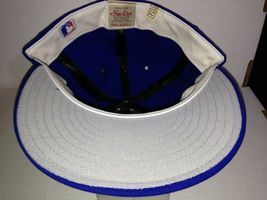 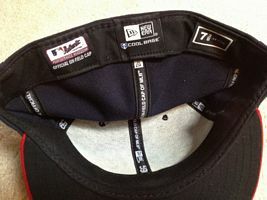 I believe this New Era is from 1972 based on the dark royal blue color, and also the buckram is from that timeframe. 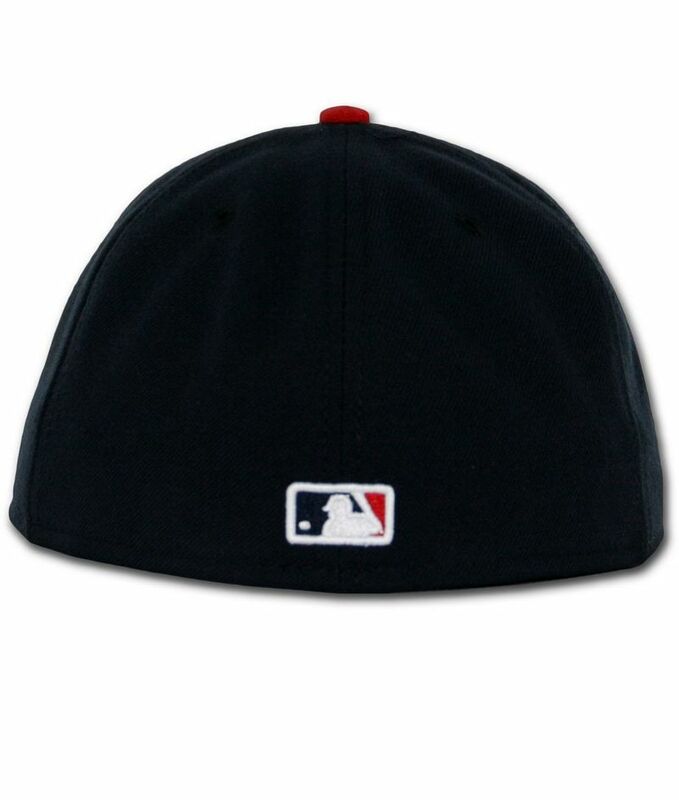 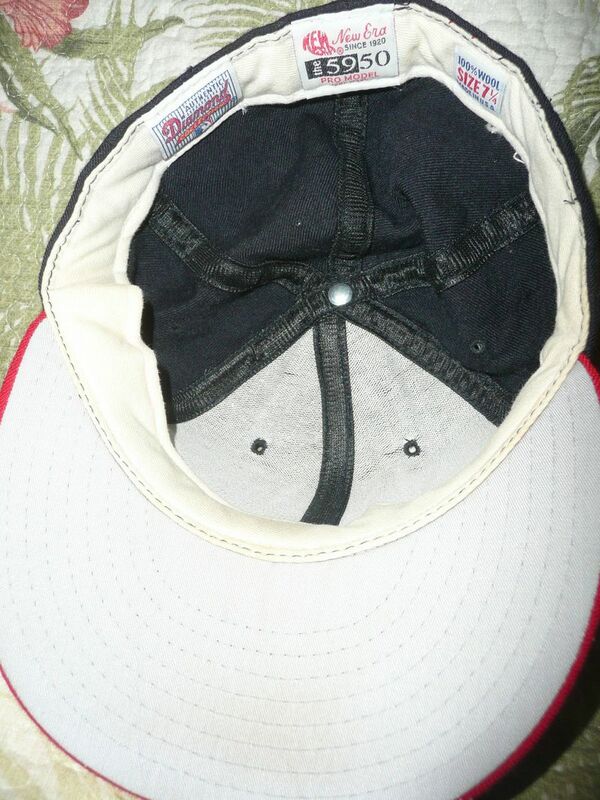 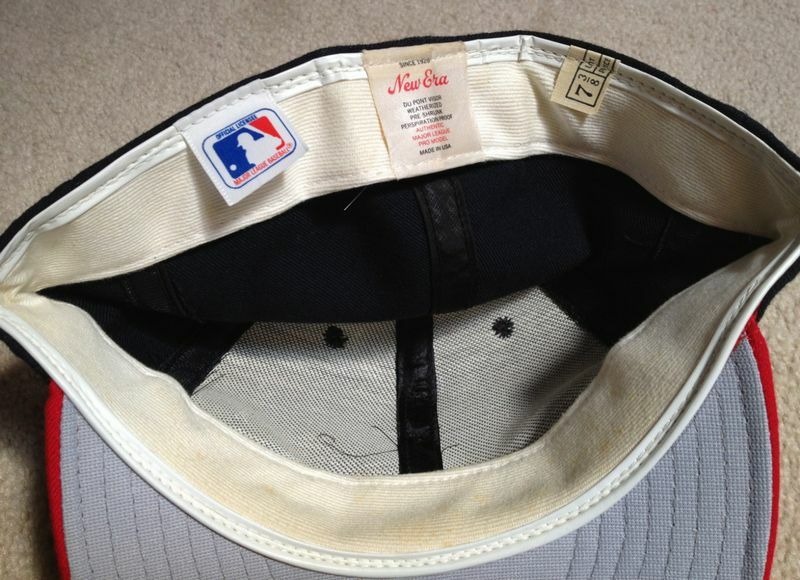 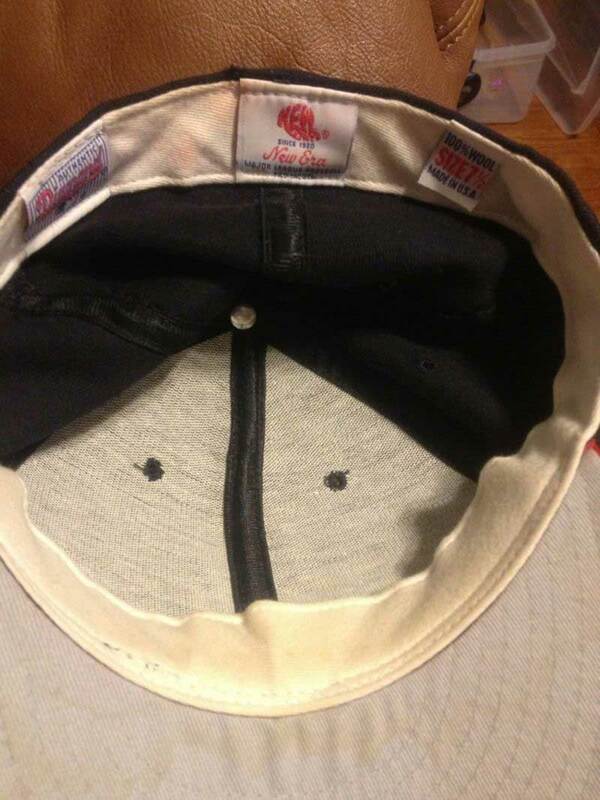 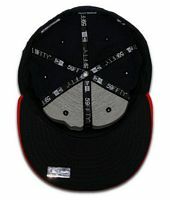 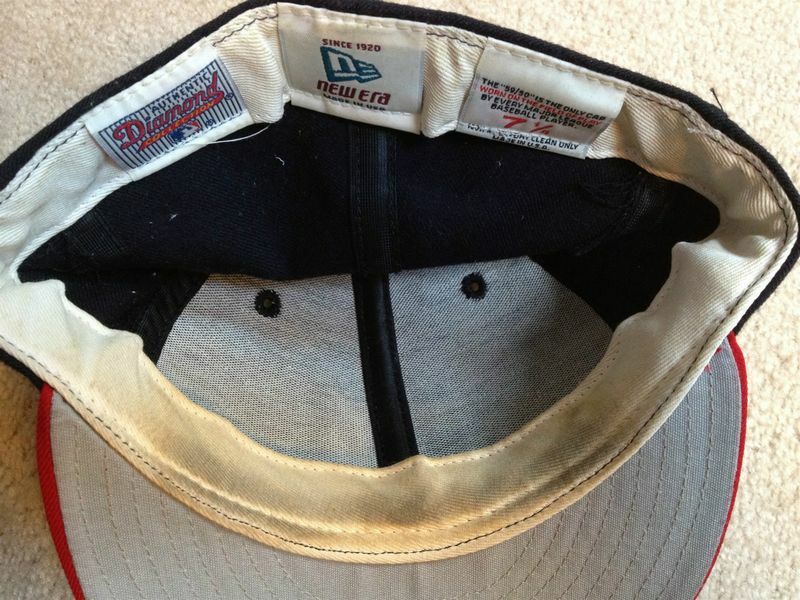 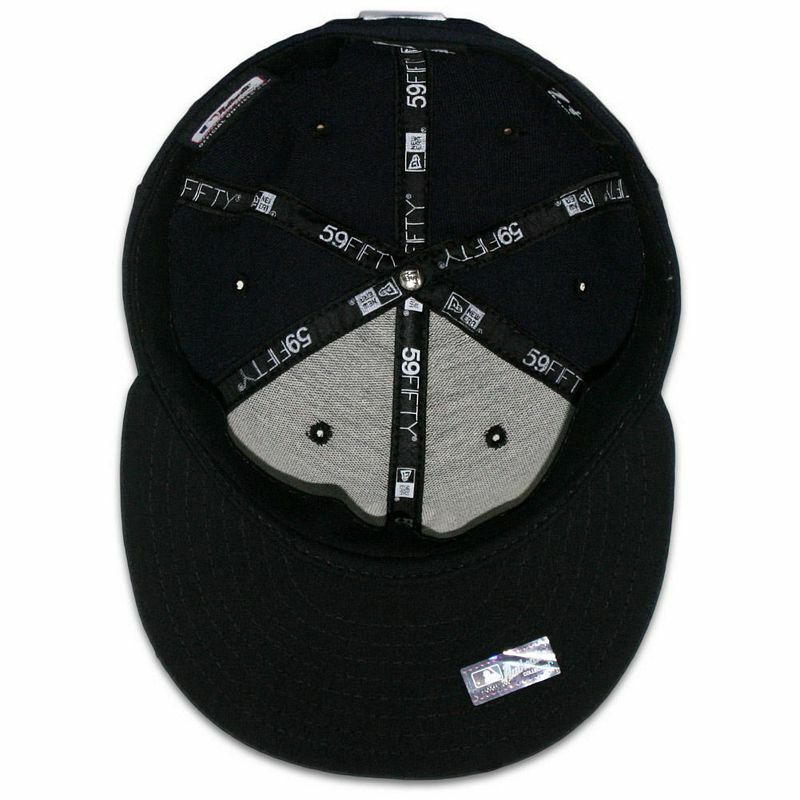 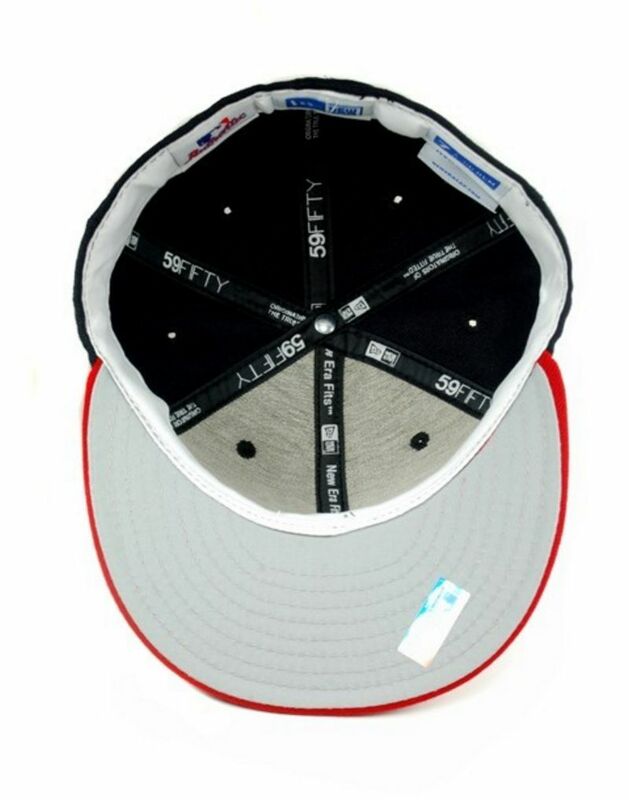 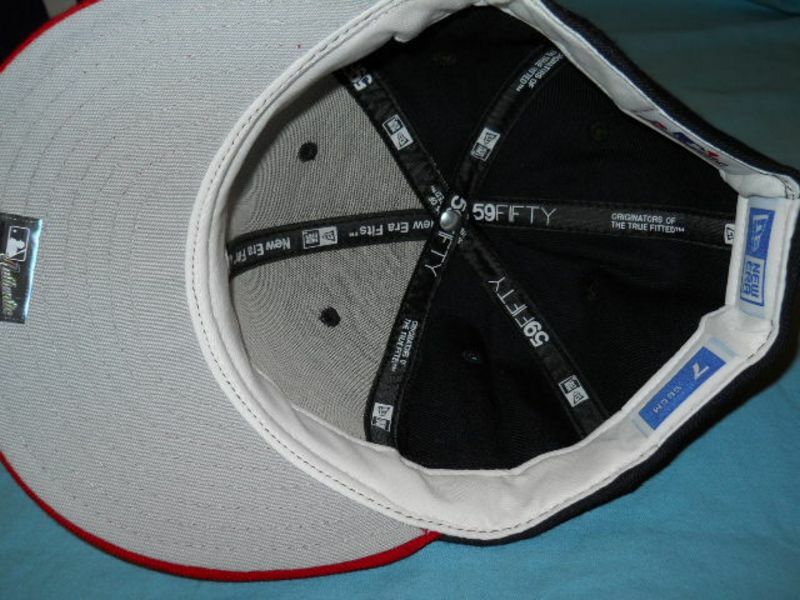 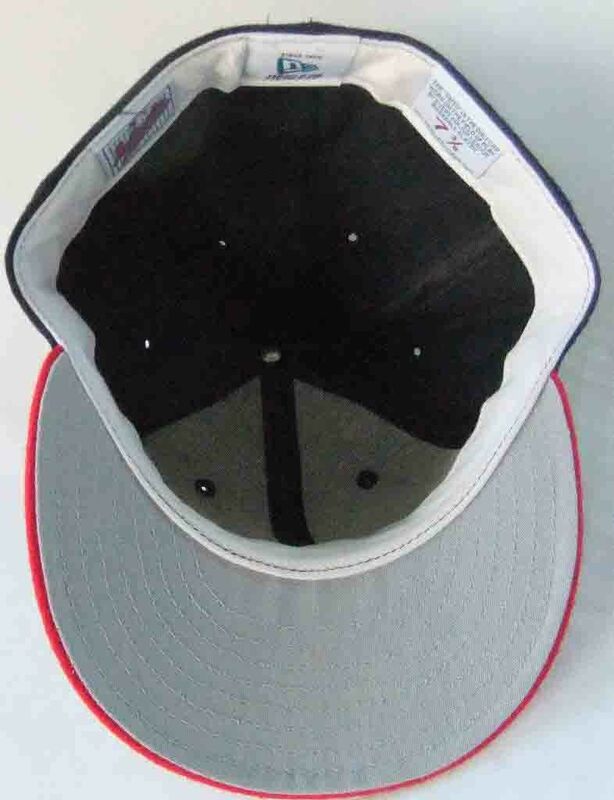 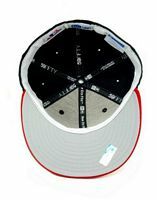 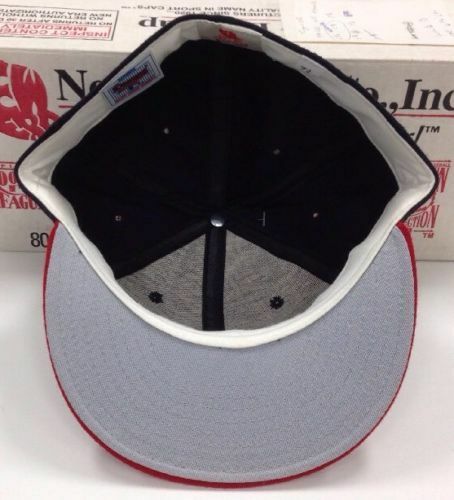 It has nylon front white panels and a grey underbrim. 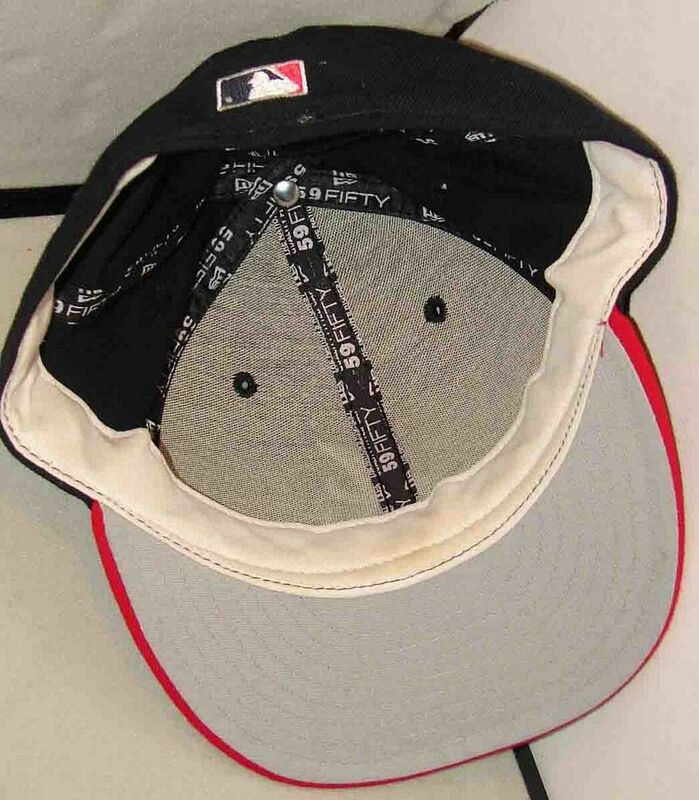 I've seen pics of players with grey underbrims from this period so I'm pretty sure these were used. 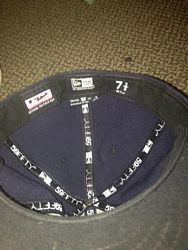 If anyone has better info, let me know. 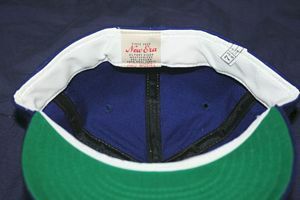 The blue color gets lighter. 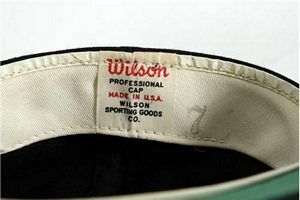 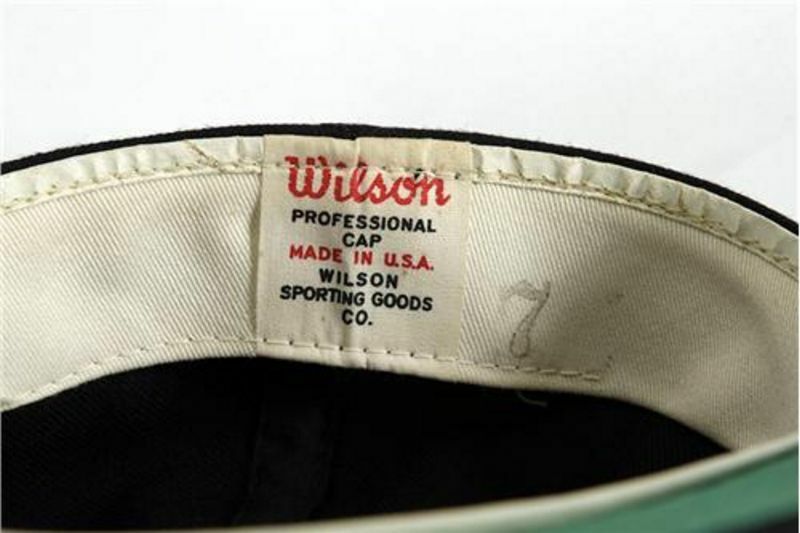 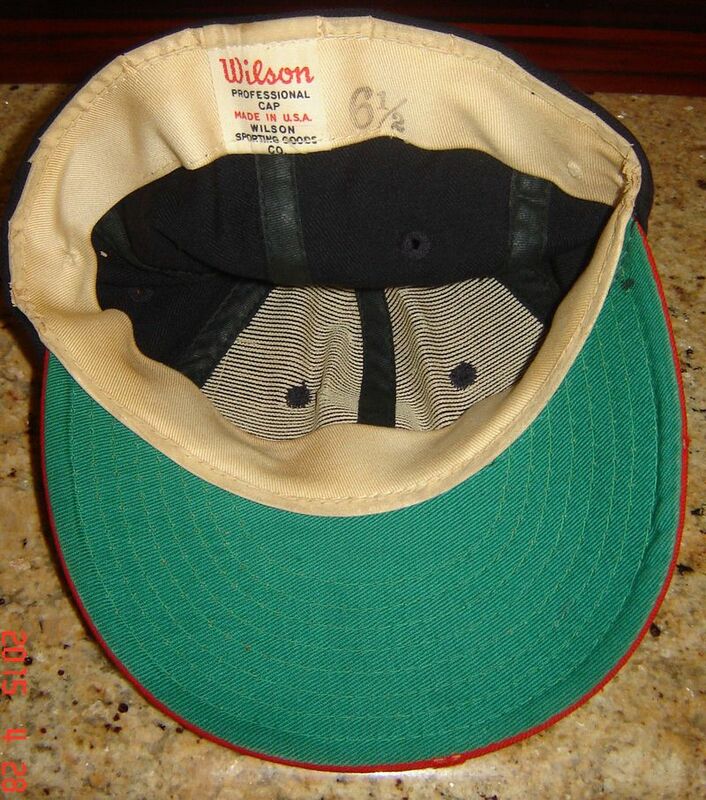 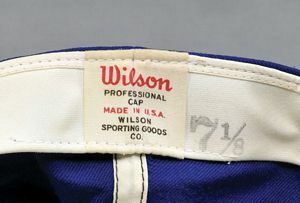 Around 1974-76 they wear Wilson caps with nylon front panels. 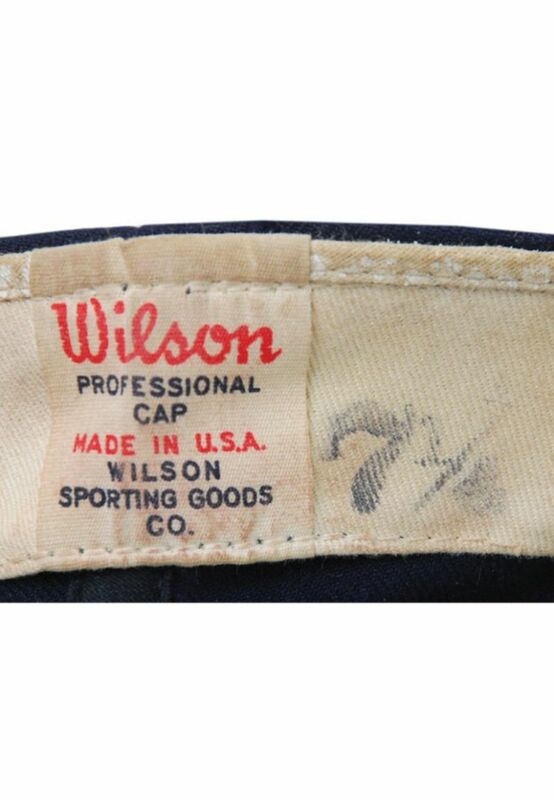 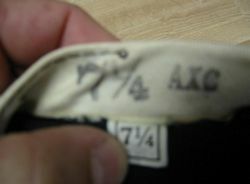 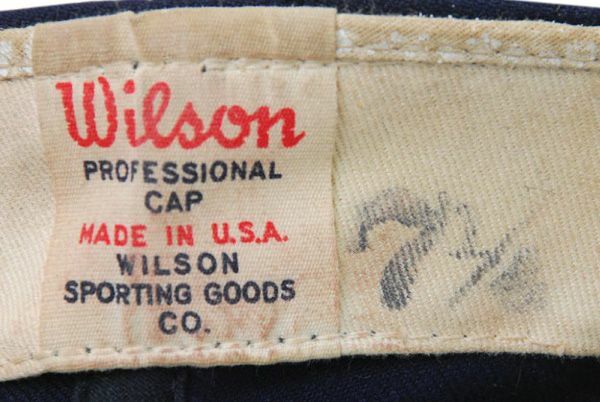 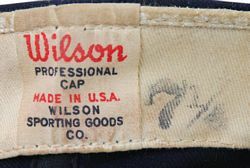 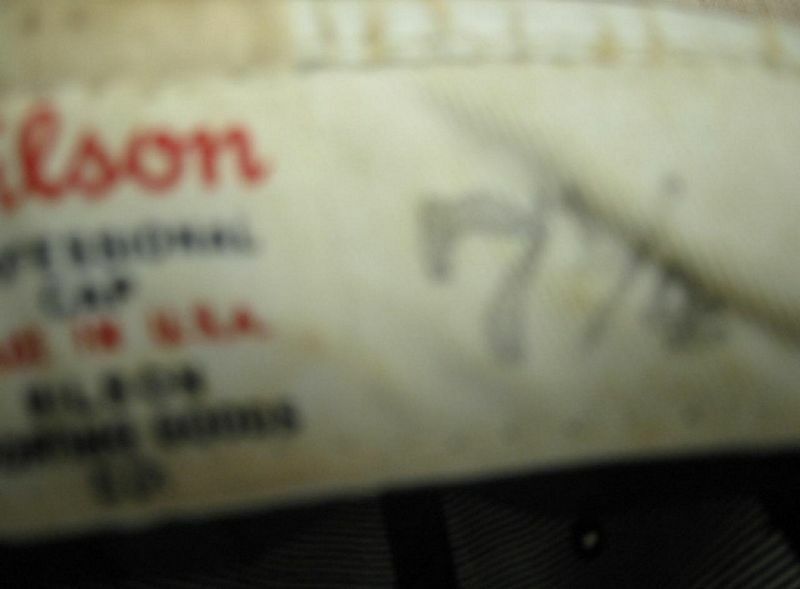 Around 1974-75 Wilson caps get a new tag styles with the size on it. Some caps had blue stitching on the nylon front panel, some white. Both are shown here. 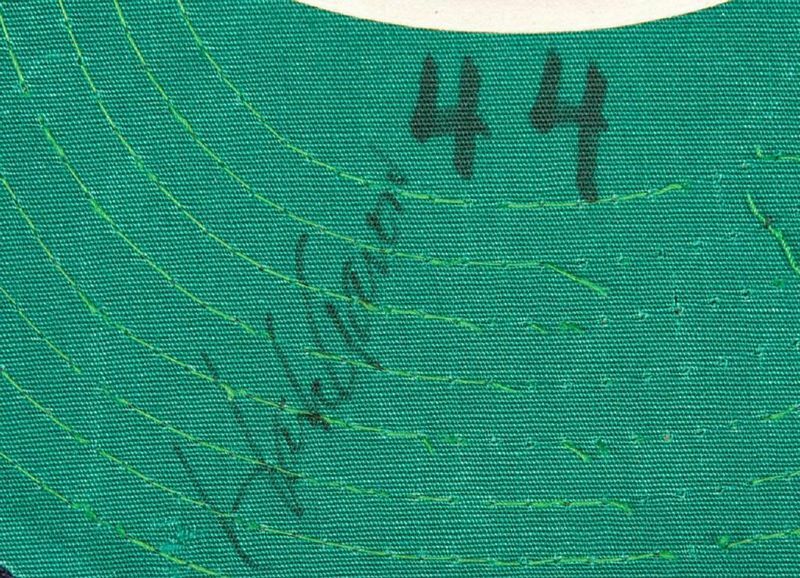 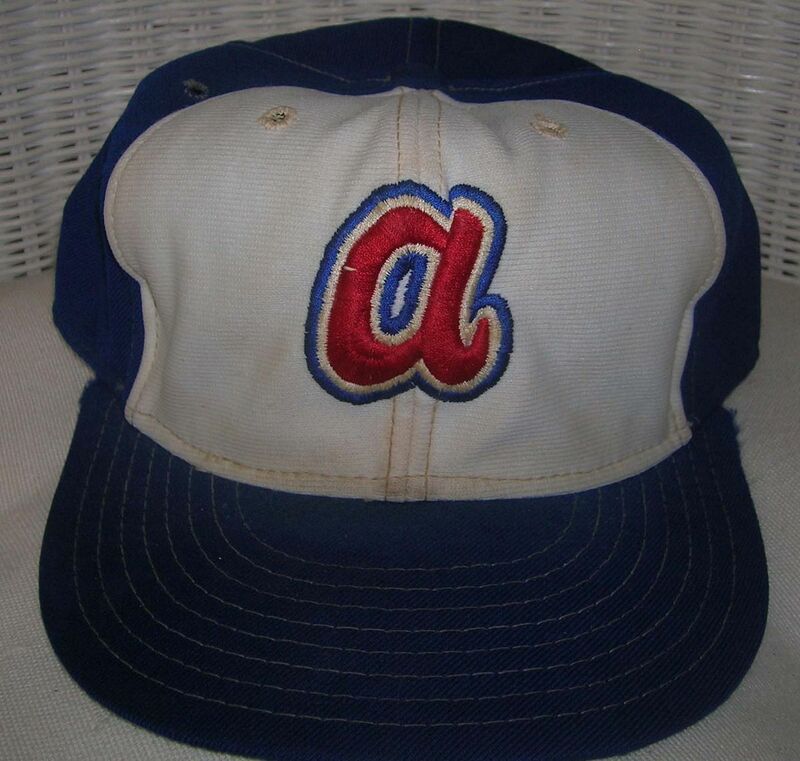 Looks like they went with New Era from about 1977-on. 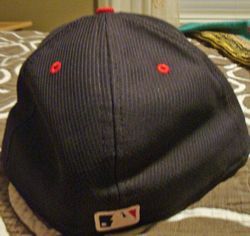 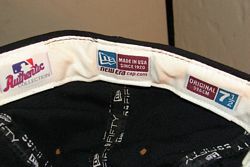 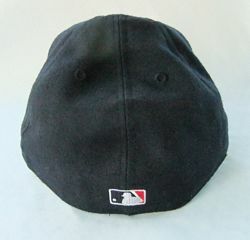 Caps have both wool and nylon front panels, and grey and green underbrims. In 1980, jerseys were redesigned. 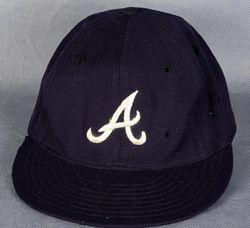 New Era small "a" caps were used for one more year. 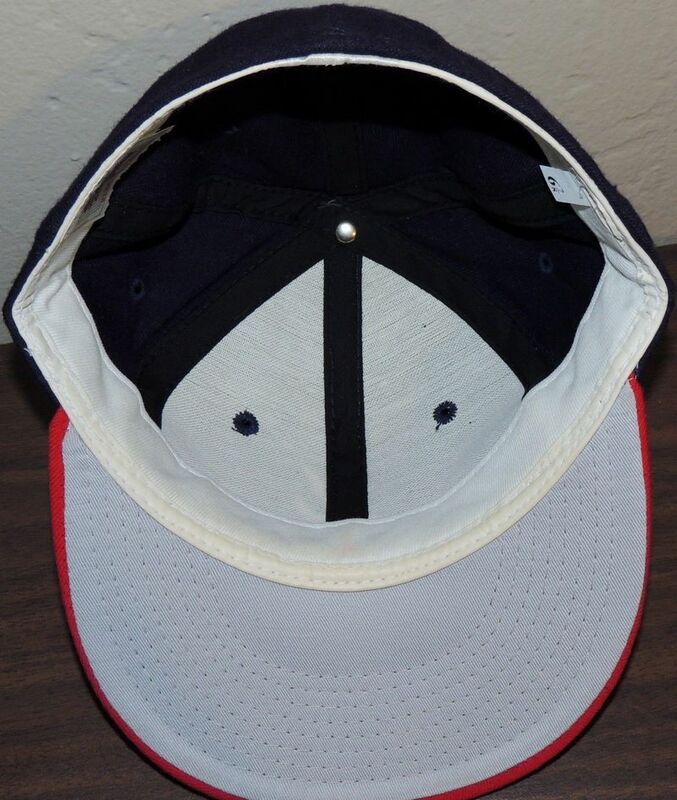 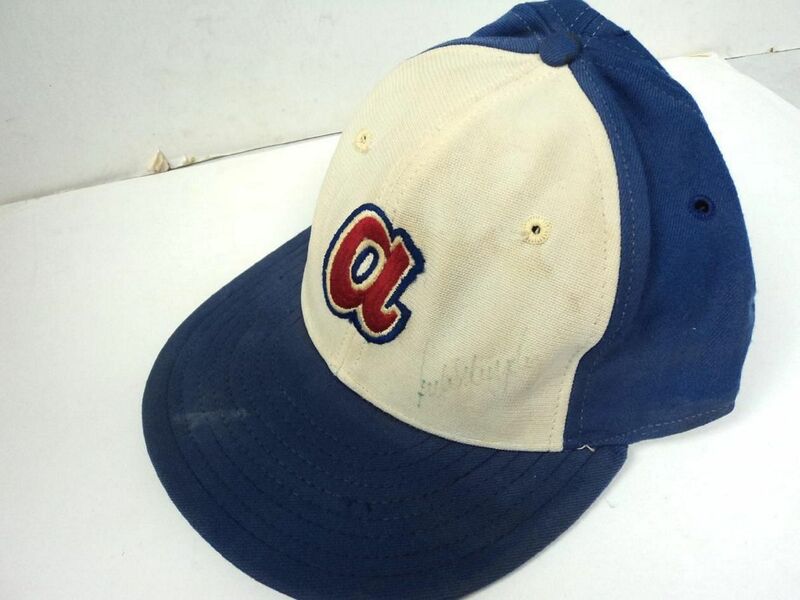 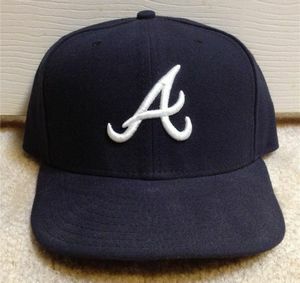 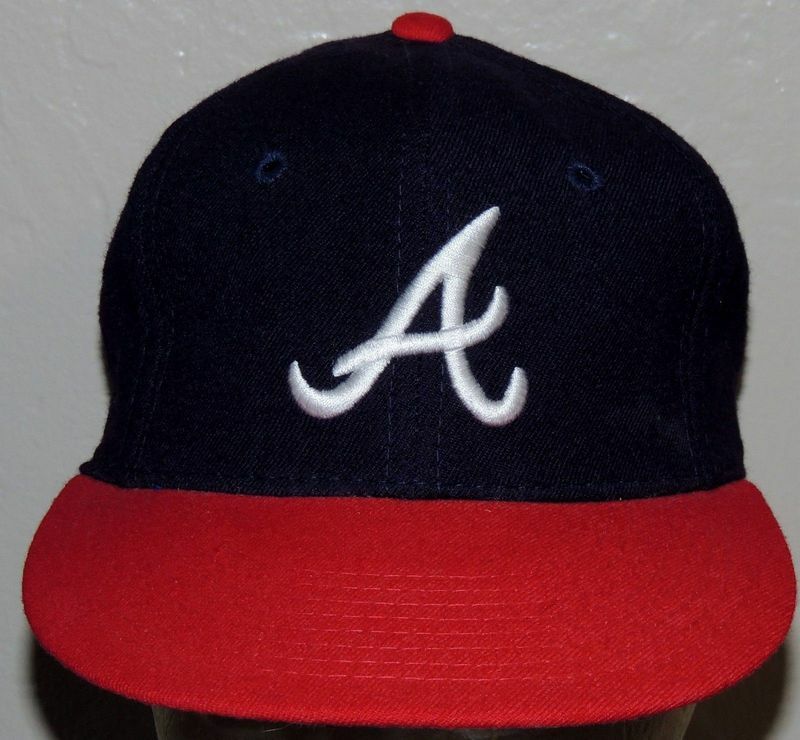 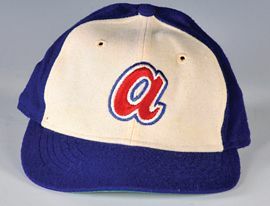 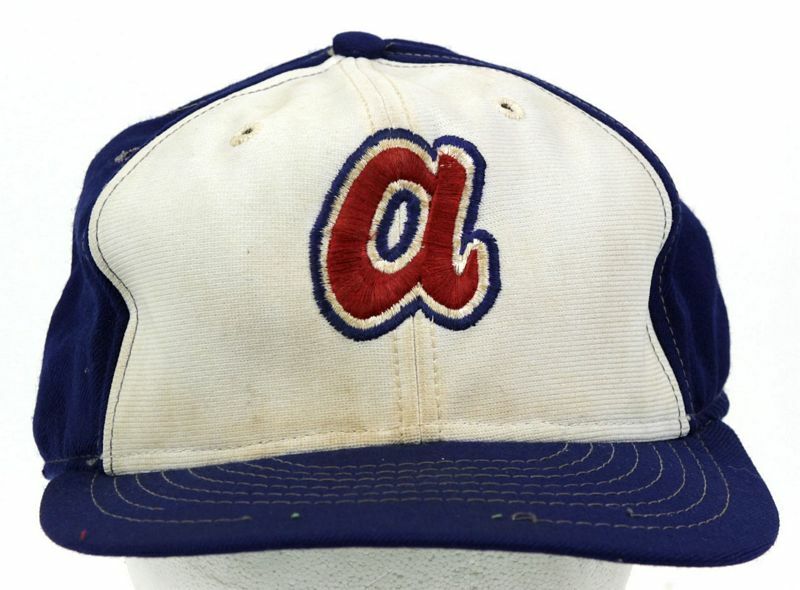 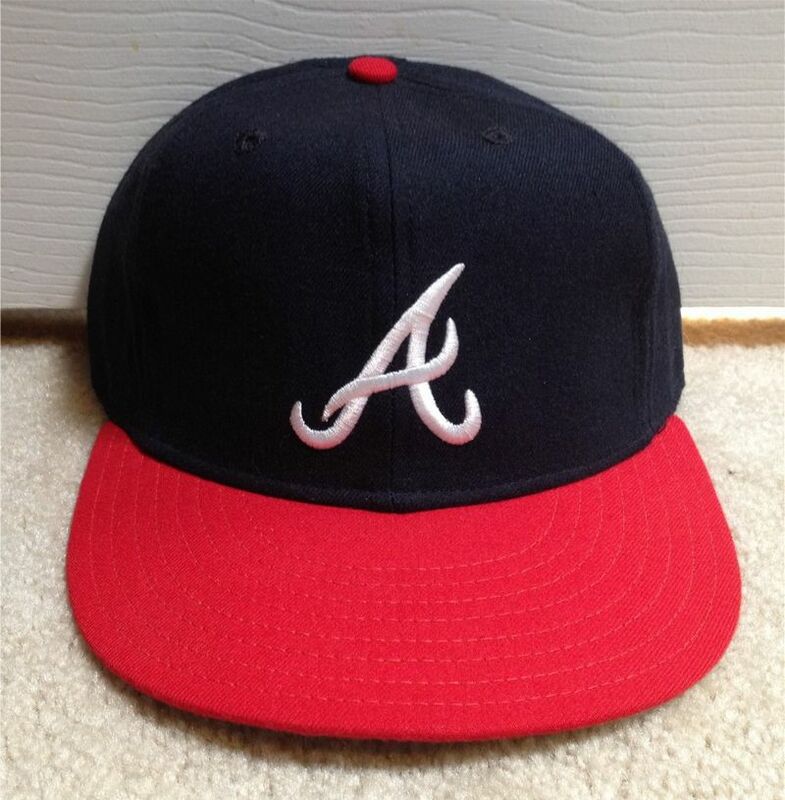 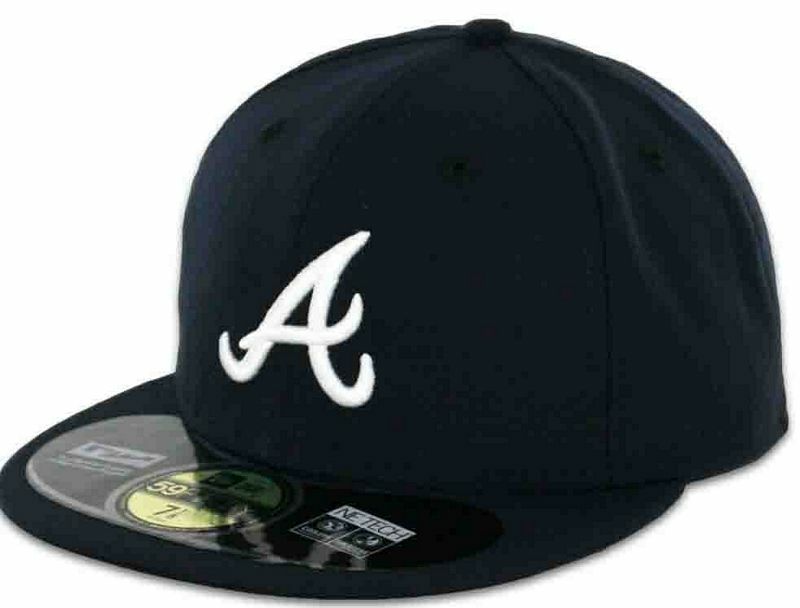 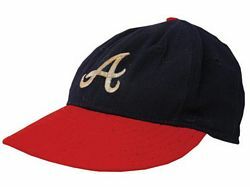 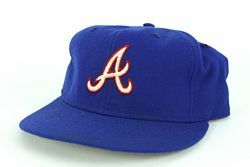 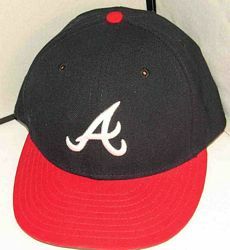 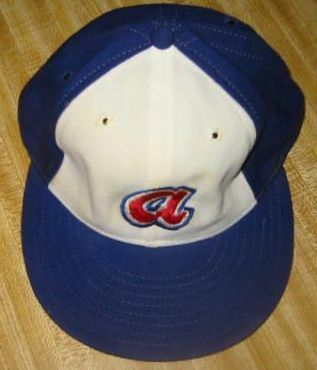 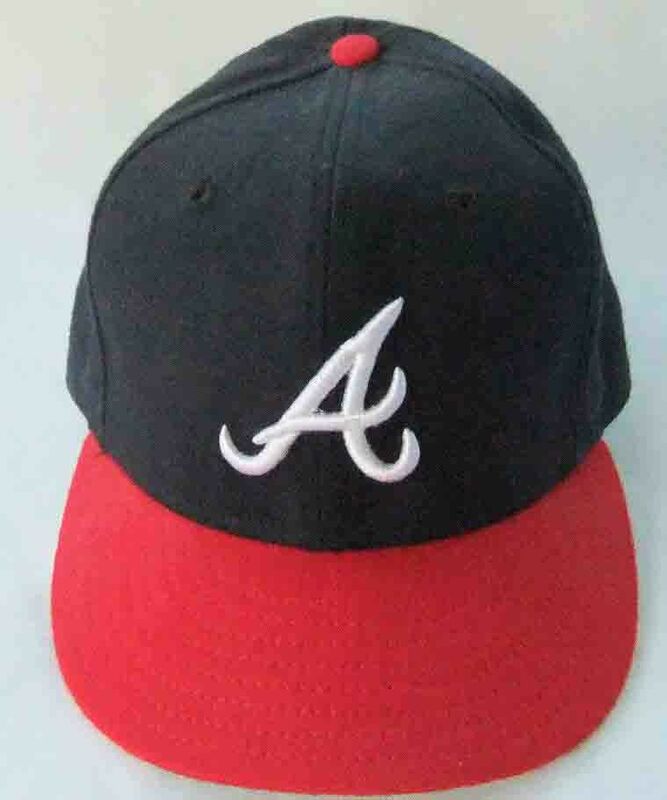 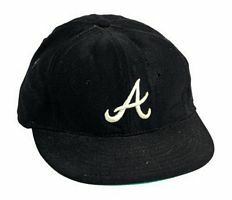 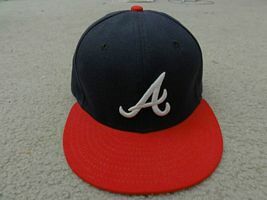 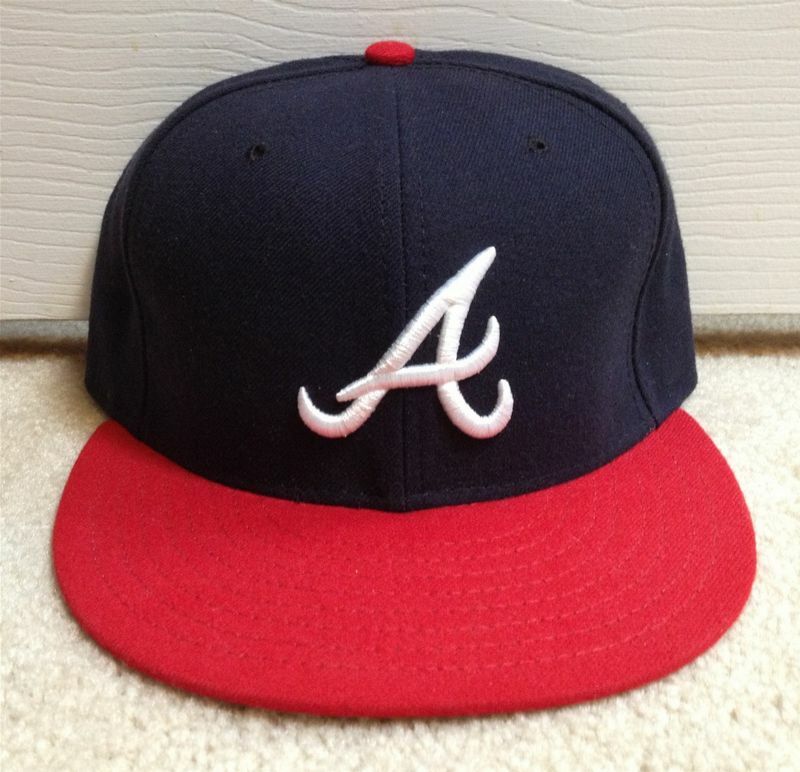 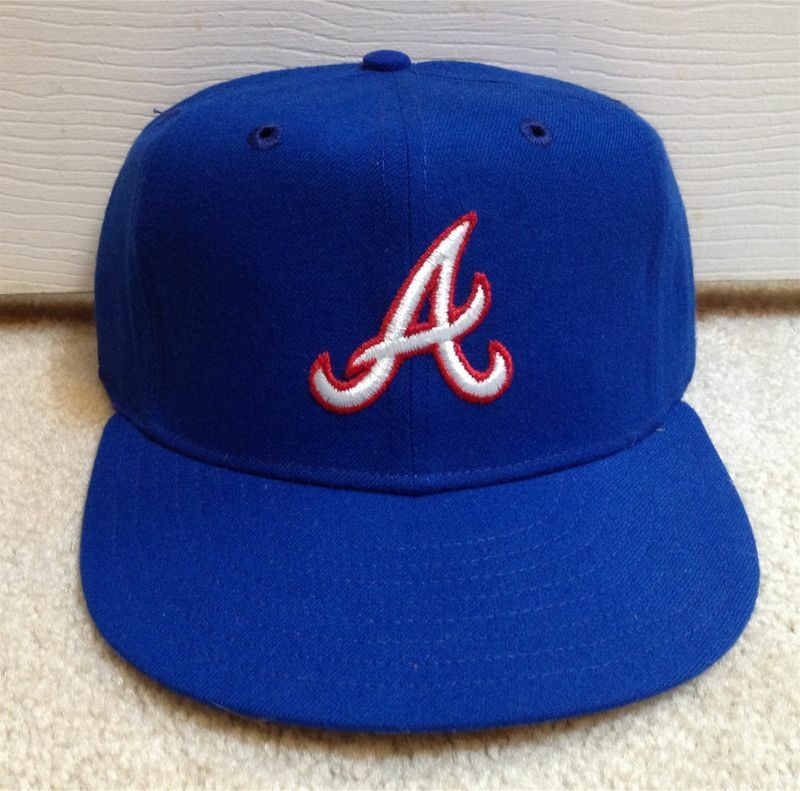 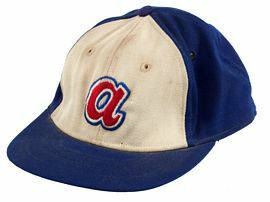 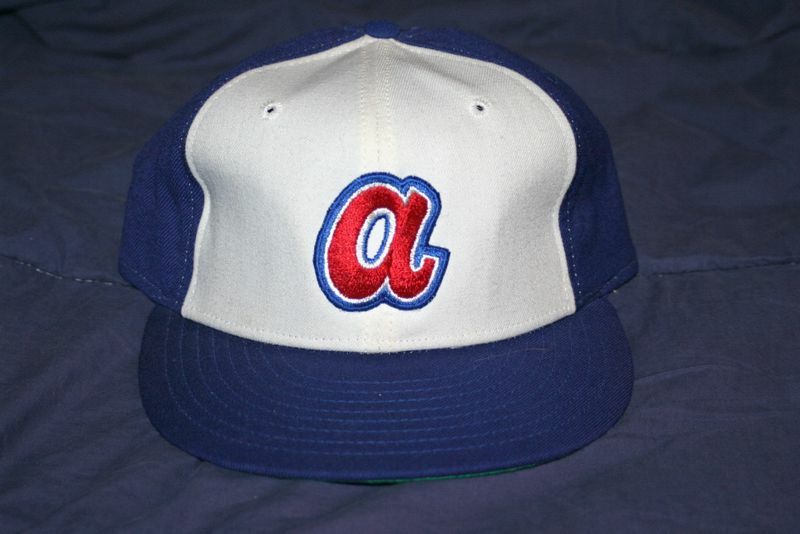 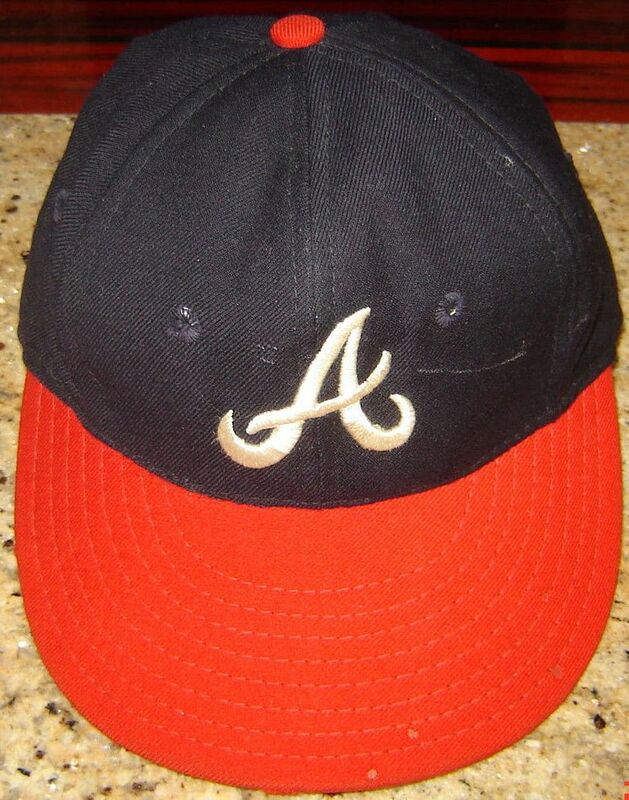 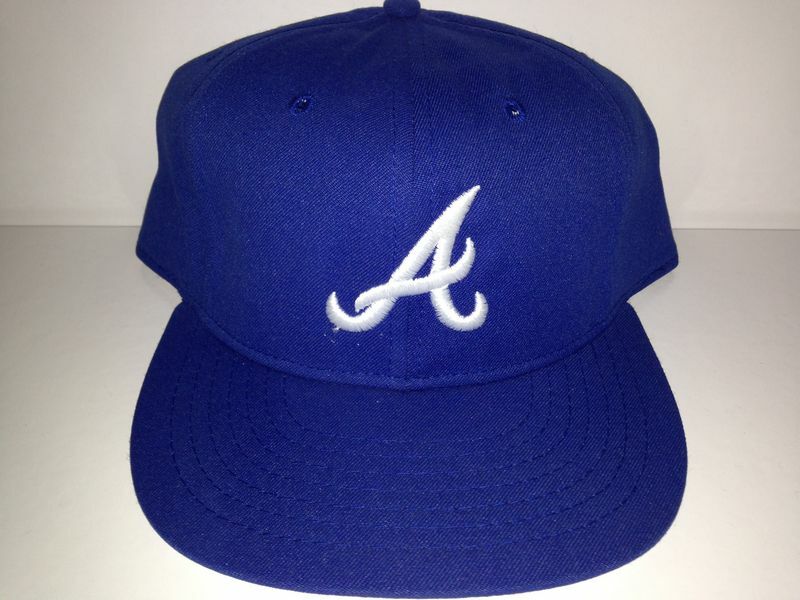 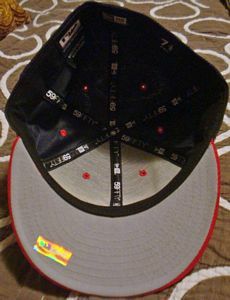 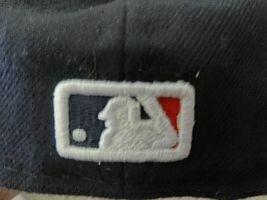 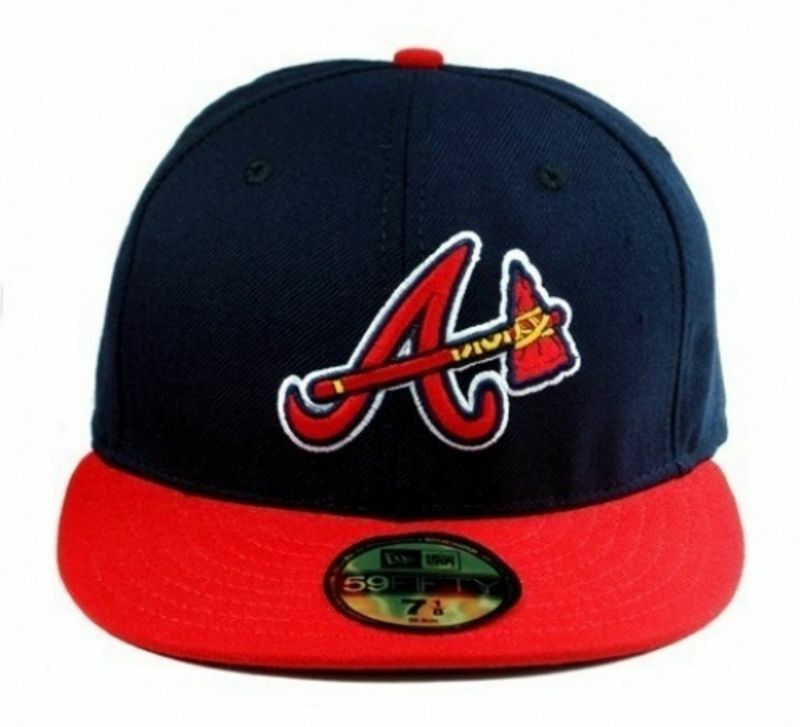 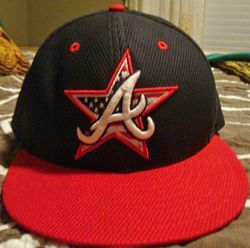 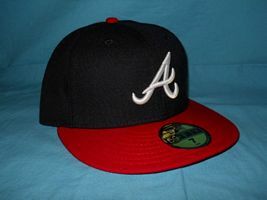 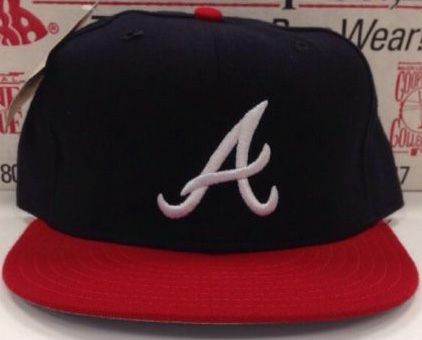 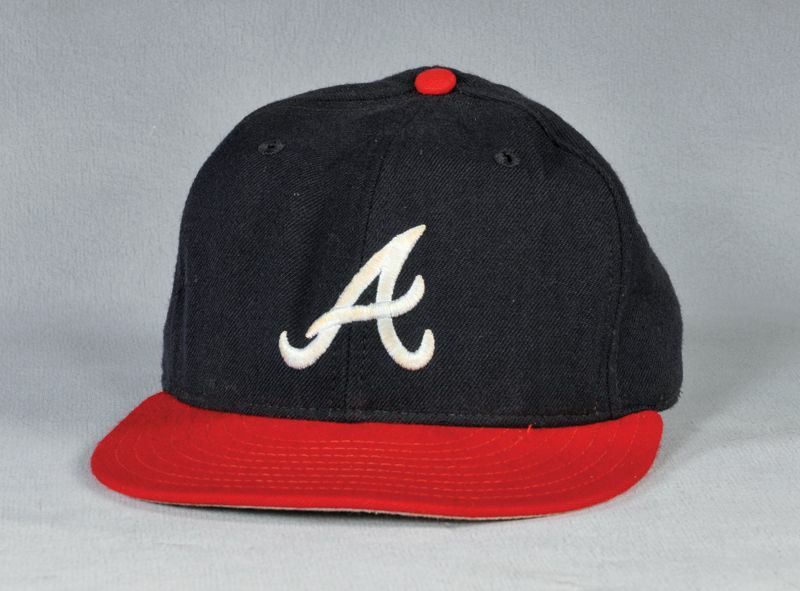 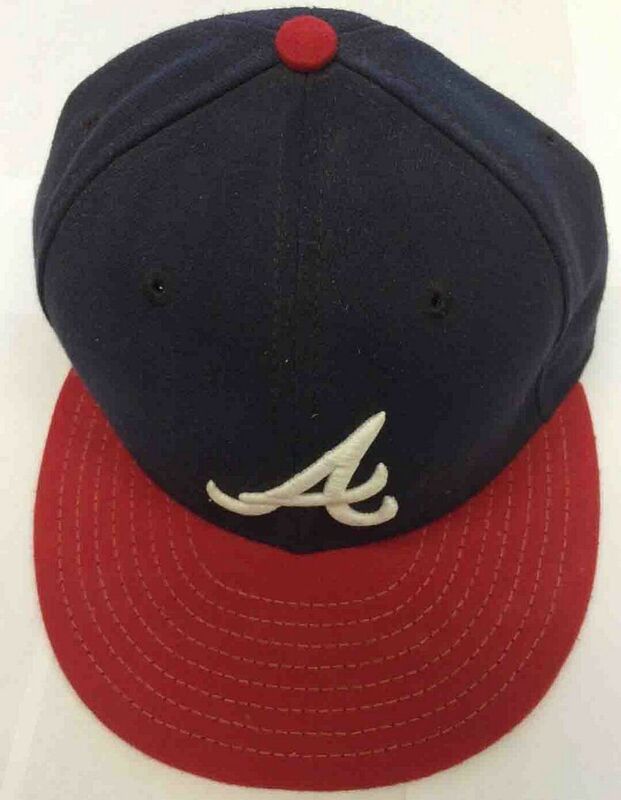 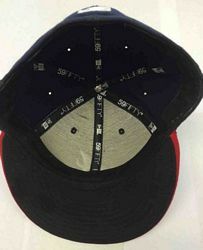 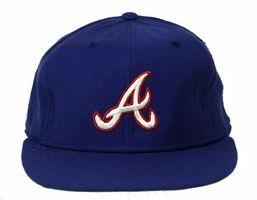 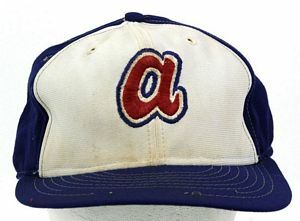 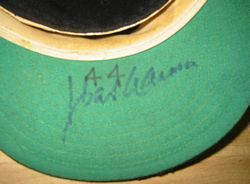 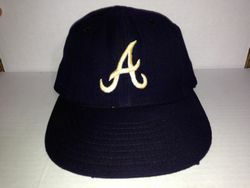 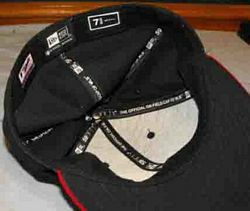 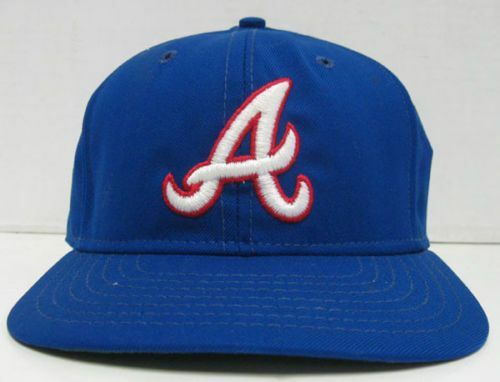 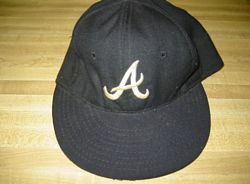 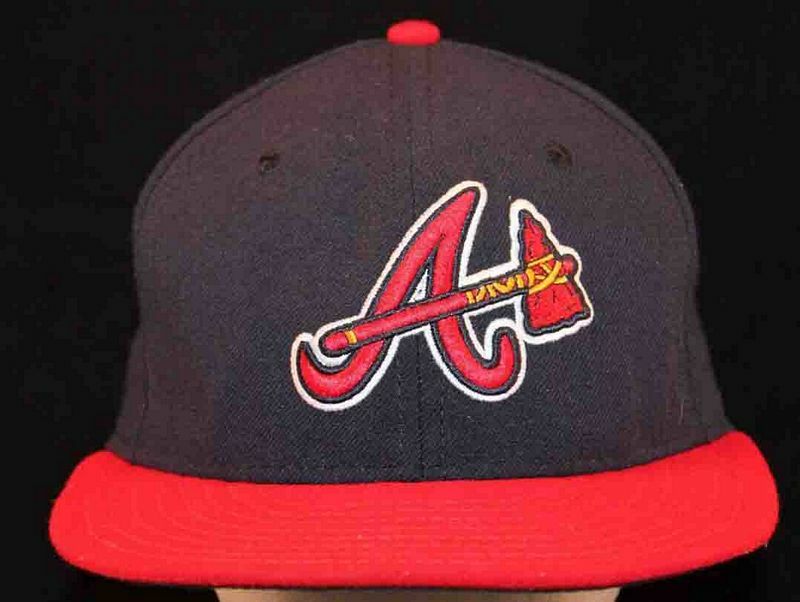 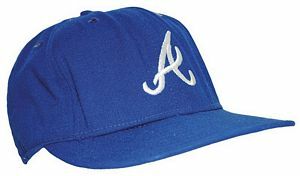 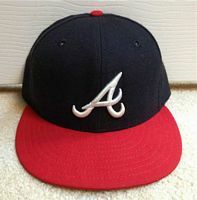 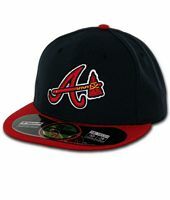 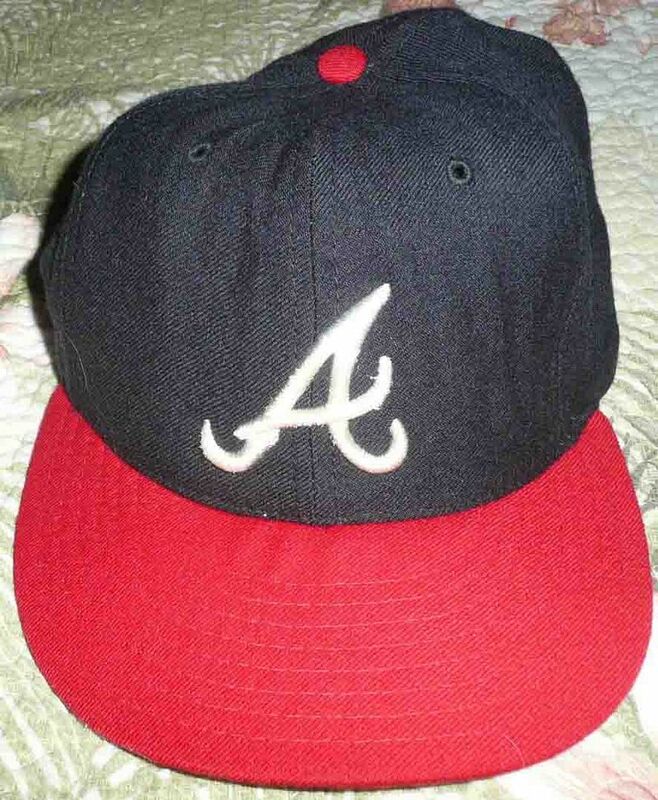 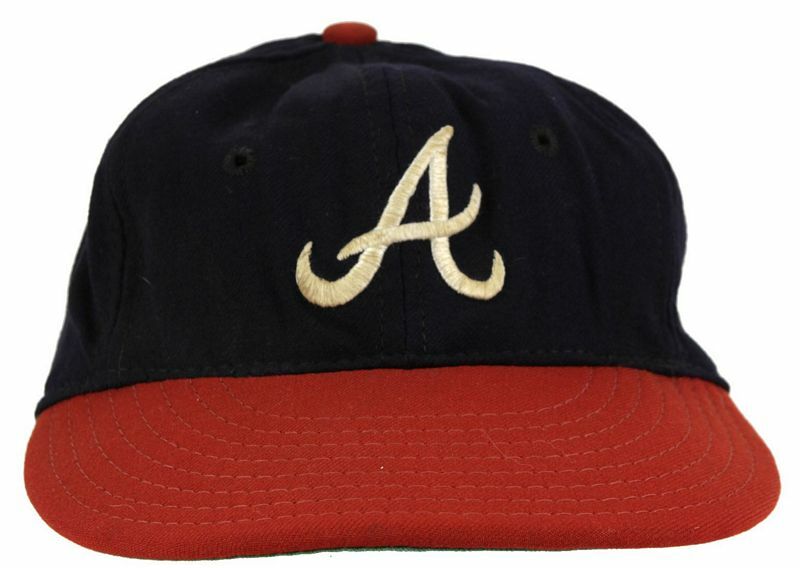 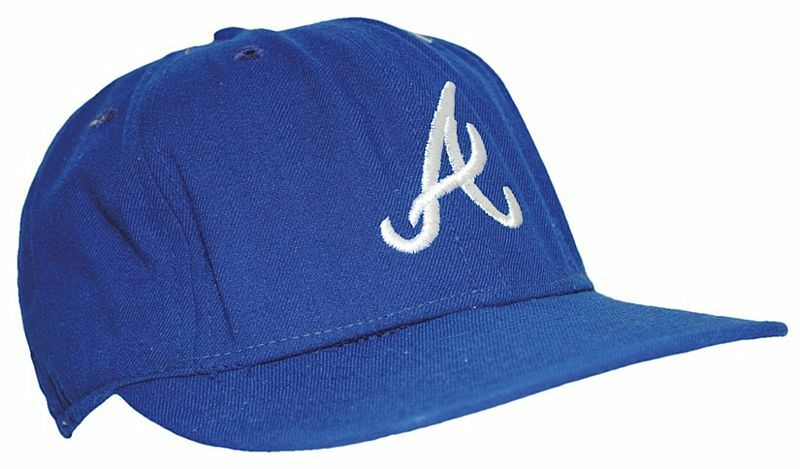 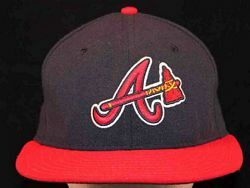 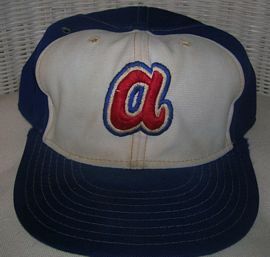 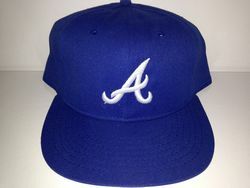 In 1981 the "A" (similar but more slanted than the first logo) is trimmed in red on the home cap and is all white on the road cap. 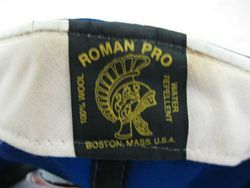 Roman caps are also used in the early 80's. 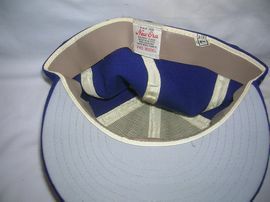 Undervisors go grey for good around 1982. Caps return to navy and red in 1987. 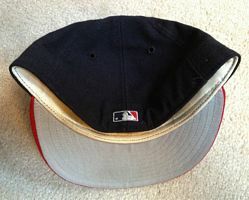 Raised embroidery introduced in 1996. 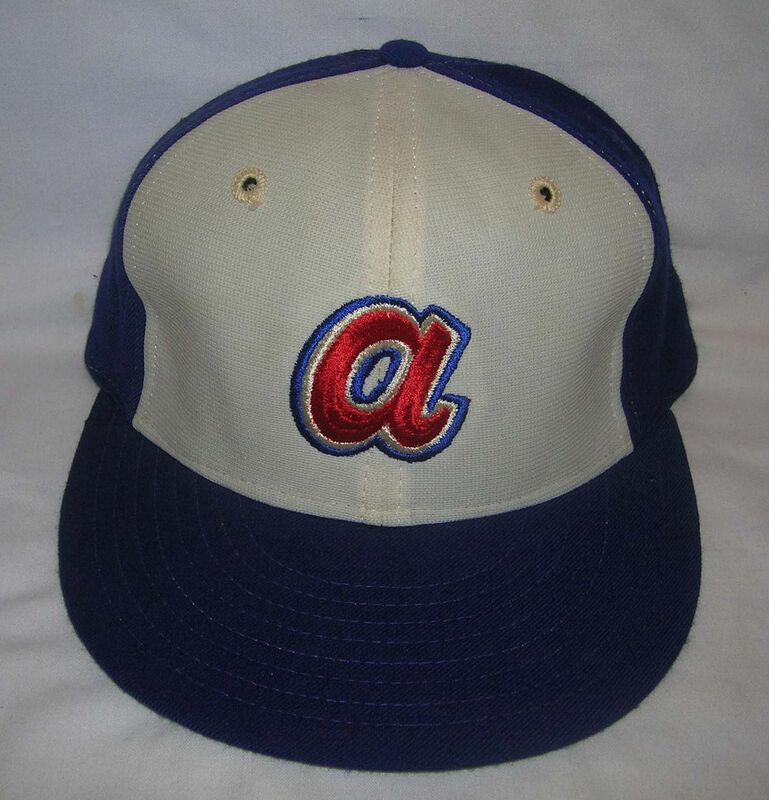 The alternate cap makes its appearance. 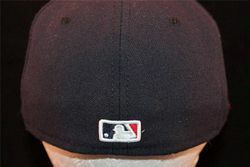 All navy alternate cap introduced in 2008. 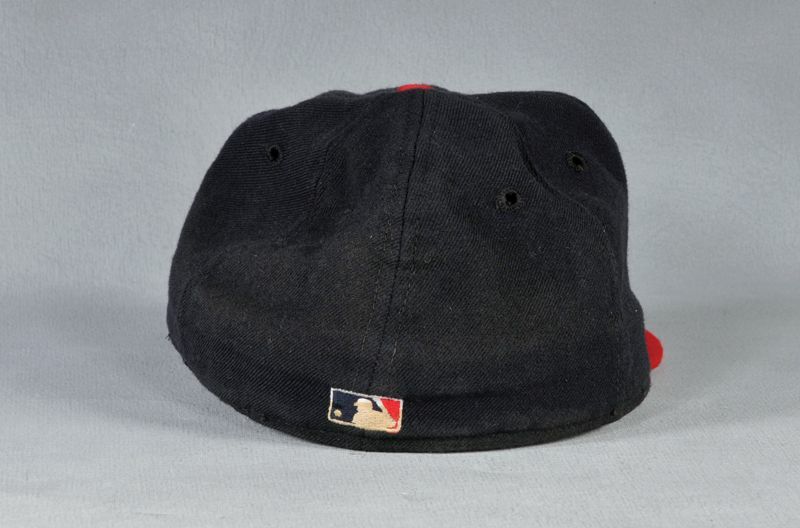 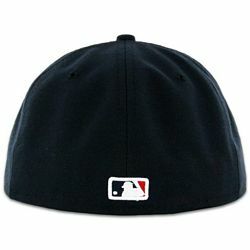 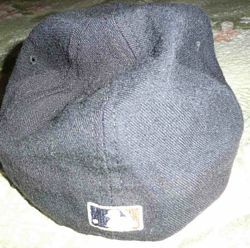 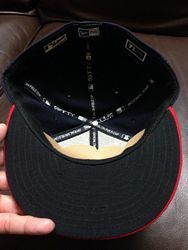 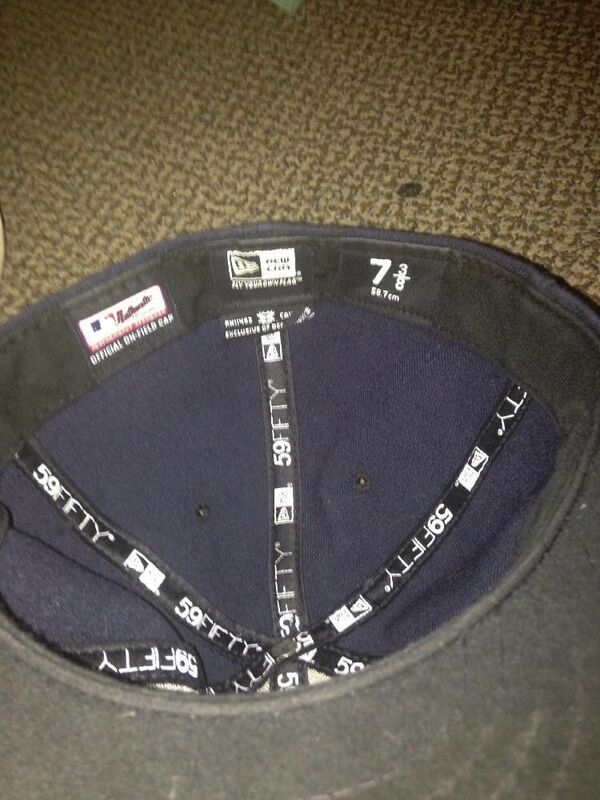 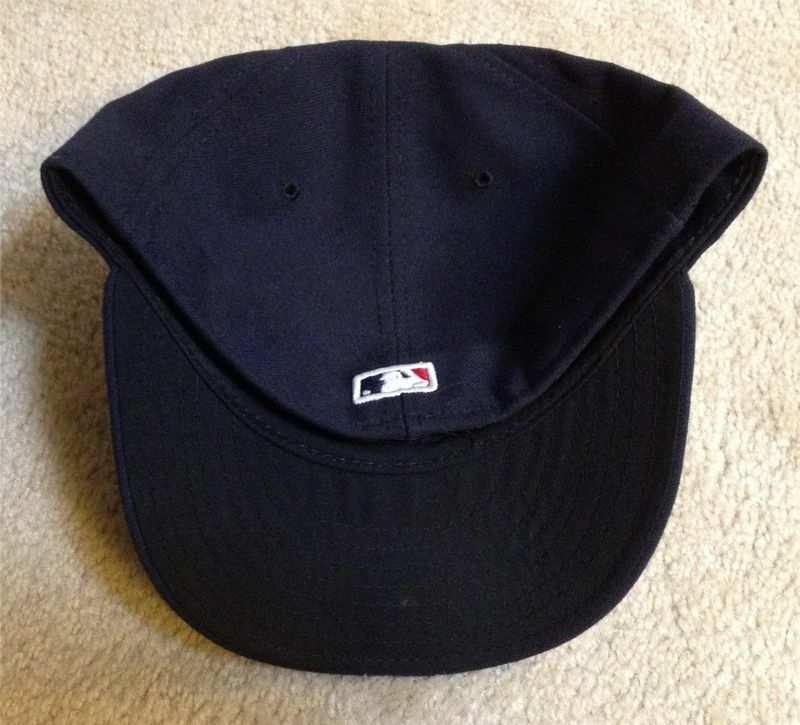 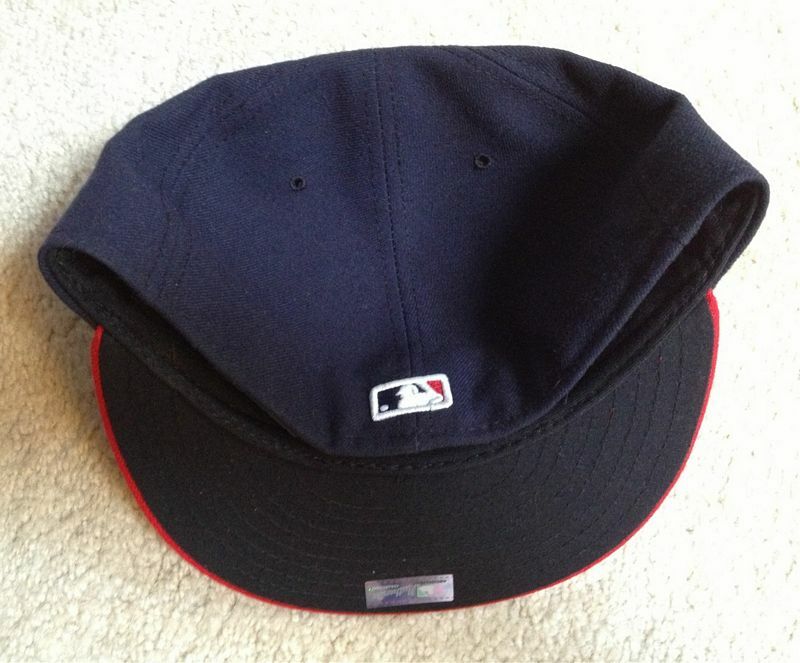 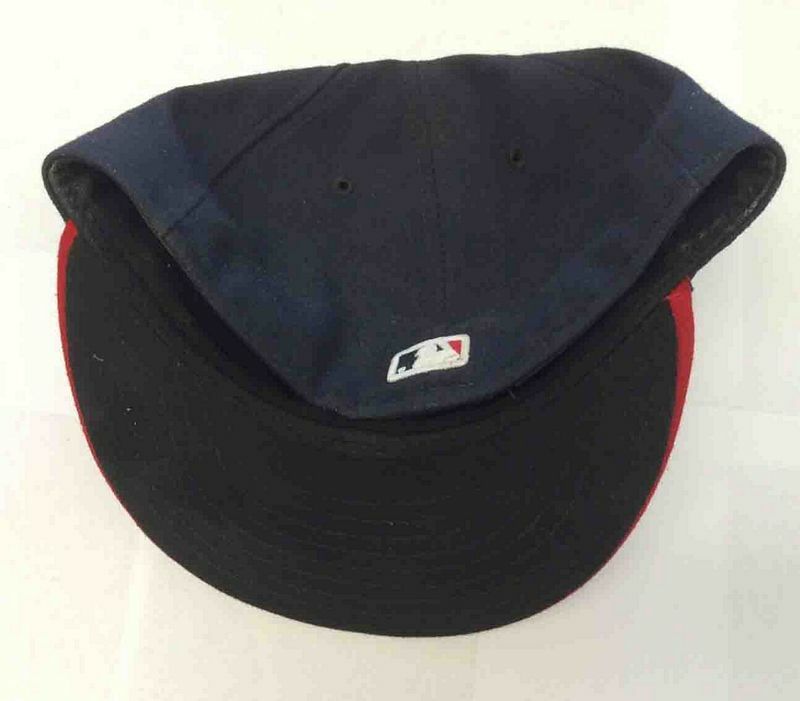 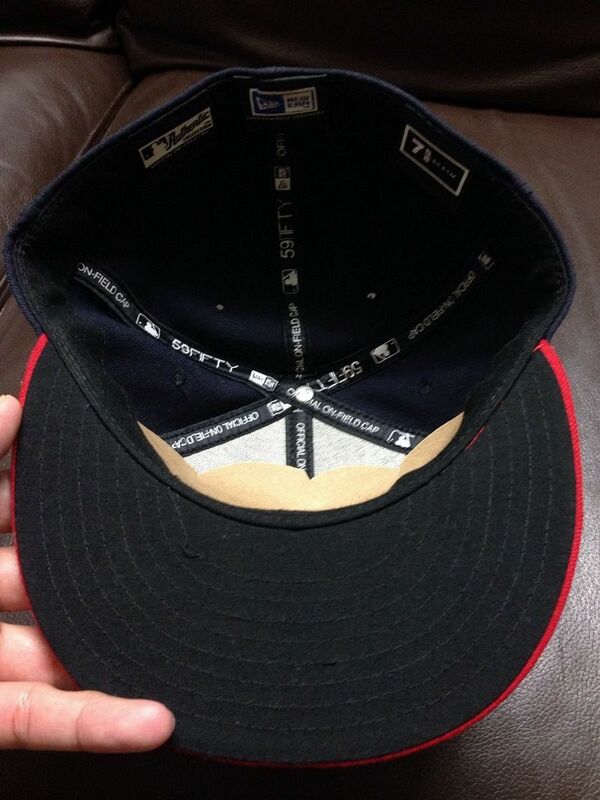 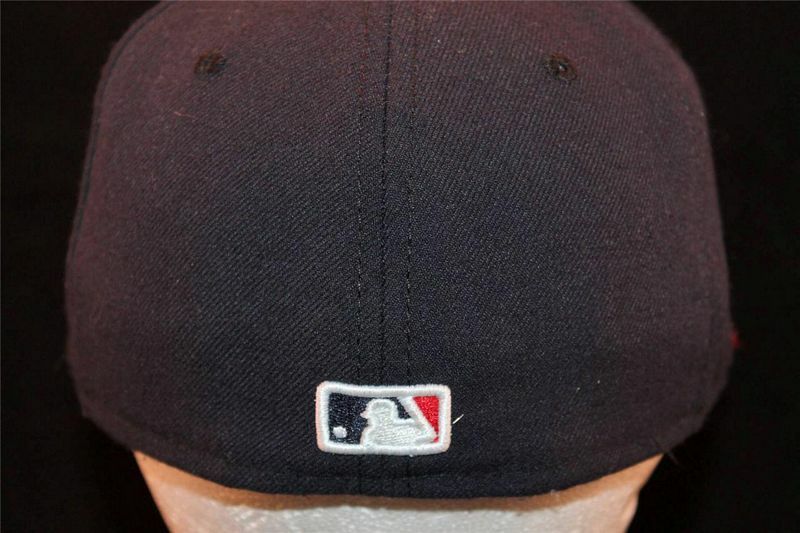 All-navy cap becomes the road cap in 2009. BP cap used with red alternate jersey. Tomahawk and BP caps dropped.